In this Rare Cut we take a look back at Dionne Warwick’s under-appreciated Got A Date album, featuring songs, production and vocals from Luther Vandross. How Many Times Can We Say Goodbye album cover. She’s one of the most gifted singers ever to record, and one of the best selling artists of all time. During the sixties she became a household name through her collaborations with the mighty duo of Burt Bacharach and Hal David, and the pair would craft some of Warwick’s biggest hits, including, but not limited to, ‘Promises, Promises‘, ‘Walk On By‘, ‘Do You Know The Way to San Jose?‘, and the original version of ‘Alfie‘. However, by the time the seventies rolled around Warwick’s output was beginning to dip, no thanks to the creative split between Bacharach and David. Warwick did score a hit with ‘Then Came You‘, a fabulous single that featured The Spinners. She would launch a concert tour with Isaac Hayes, which yielded the excellent live album A Man and A Woman, featuring the superb mixing of ‘By The Time I Get To Phoenix’ and ‘I Say A Little Prayer’ into one song. Truly magnificent. Then in 1979 she signed with Clive Davis on his Arista Records label, and had a ‘comeback’ with the million-seller ‘I’ll Never Love This Way Again‘. She released a couple more albums, including an excellent live album – but they didn’t match the success of her first Arista hit. Then, nearly 3 years later she scored a huge hit with the Heartbreaker album, produced by the Bee Gees, who gave Warwick a mega-hit with the album’s title track. To follow-up the success of Heartbreaker Warwick was paired with a new, up-coming singer-songwriter-producer by the name of Luther Vandross. Vandross had begun his career singing on Sesame Street as well as recording jingles for radio adverts. He became a sought after backing vocalist and vocal arranger, working with Chic, Bette Midler, Roberta Flack and even David Bowie on Young Americans. He went solo in 1980 releasing his epic debut album Never Too Much. 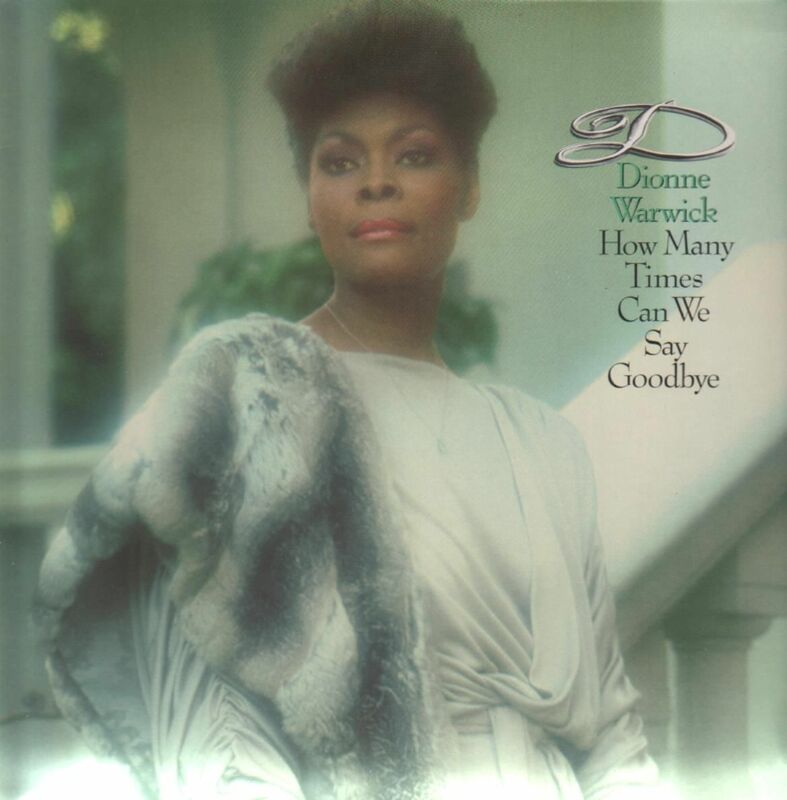 The album featured a cover of a Dionne Warwick classic, ‘A House Is Not A Home‘. Unlike Warwick’s version, it featured a stripped back, much slowed down arrangement that allowed Luther to lengthen the song to 7 minutes, creating in the process arguably the best version of the Bacharach-David classic ever recorded (sorry Dionne). But even Warwick agreed. In her autobiography Warwick said that his version of ‘A House Is Not A Home’ was “so beautifully done, I was at a loss for words”. Vandross would famous go on to sing the song at the 1986 NAACP Image Awards directly at Warwick, delivering perhaps his best ever live performance, and making Warwick cry in the process. Given Vandross’s rising fame and reputation as a producer and songwriter, he would craft hits for Aretha Franklin and Cheryl Lynn, as well as himself in the same period, pairing him up with Dionne Warwick seemed logical. And it’s probably safe to assume that Vandross was excited with the prospect. The album was entitled How Many Times Can We Say Goodbye, and was a mixture of Vandross’s eighties grooves and Warwick’s timeless elegance. The album opened with the fabulous “Got A Date”, a song produced in the same mould as Vandross’s break-out hit ‘Never Too Much‘. The song was written by Vandross and bassist Marcus Miller, and you can hear Miller’s tasty bass chops run throughout the song. It was a bouncy, dance-able track that featured a simple but catchy lyric, not dissimilar to her hits written by Bacharach and David. Vandross kept the groove going on ‘I Do It Cause I Like It‘, another catchy eighties groove that somehow went unnoticed. But for much of the album Vandross returned Warwick to her roots, featuring some excellent ballads and orchestral arrangements. Michael McDonald contributed one song, the emotional and sparsely arranged ‘I Can Let Go Now‘, and Warwick even wrote one song, ‘Two Ships Passing Through The Night‘. Warwick even found room for a cover of The Shirelles’s hit ‘Will You Still Love Me Tomorrow‘. The song even featured The Shirelles, but Vandross slowed the arrangement right down compared to the original, just as he had done with his version of ‘A House Is Not A Home’. What we therefore hear is a completely different reading of the same song, and it’s quite frankly spectacular. For the album Vandross had written a song specifically for Warwick entitled ‘So Amazing’. It was the best song on the album, a perfect ballad. Warwick’s vocal is perfection, and the production is stunning. Yet, for reasons unknown to me, the song failed to become the hit it should have been. Disappointed, but not deterred, Vandross would cover the song himself a few years later on his 1986 classic album Give Me The Reason, and became the hit it ought to have become in 1982 for Warwick. “I recorded ‘How Many Times Can We Say Goodbye’ with him. He gave a magnificent performance and brought out the best in me. He felt the only way to do it was if we were in the studio at the same time. I think that’s the way it should be done. But many duets are done with the partners recording their part separately and at different times. I believe this is the way the Frank Sinatra Duets albums were recorded. All in all, the How Many Times Can We Say Goodbye album is fantastic. It’s arguably one of Warwick’s best, and it’s produced to perfection by Luther Vandross. The pairing of super-fan Vandross with his hero Warwick was an excellent one by Arista, and the results were extremely positive. So it’s hard to understand why the album and its singles never became hits the way it ought to have done. Thankfully the album was re-released a few years back with some added extras. I thoroughly recommend you check it out.